Victoria Boutenko is an author, teacher, inventor, researcher, artist and mother of three. She teaches classes on healthy living and raw food all over the world. As a result of her research and teachings, thousands of people are drinking and sharing green smoothies. Victoria Boutenko is an author of 12 Steps to Raw Foods, Green Smoothie Revolution, Raw Family Signature Dishes and Green for Life. Green for Life is an award winning, international best seller which has been translated into 26 languages with over a quarter of a million copies being sold world wide. Caryn: Hello Everybody we’re back. I’m Caryn Hartglass and your listening to It’s All About Food here on this October 29th 2013. I got my drink. Did you get yours? I got a nice little cocktail here made of Kale, Escarole – I was just talking about Escarole, lots of celery, beets, a little lemon with the rind on ice. Pretty good cocktail. It’s gonna get me through the rest of the day. Alright, let’s talk about more green food. My favorite food which is green and I want to bring on my next guest Victoria Boutenko, who is the author of Green Smoothie Magic. She’s an author, teacher, inventor, researcher, artist and mother of three. She teaches classes on healthy living and raw food all over the world. As a result, her research and teaching, thousands of people are drinking and sharing green smoothies. 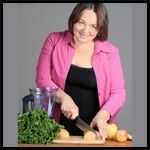 She’s the author of 12 Steps to Raw Foods, Green Smoothie Revolution, Raw Family Signature Dishes and Green for Life. Green for Life is an award winning, international best seller which has been translated into 26 languages with over a quarter of a million copies being sold world wide, with more at: http://www.rawfamily.com. Victoria, Welcome to It’s All About Food. Victoria: Thank you so much for having me. Caryn: Yes, well I have known about you and your wonderful works for a very, very long time and it’s absolute pleasure to have sometime to be able speak to you directly. Victoria : I’m pleased too. Caryn: I read your brief file but what I want to know is how did you get so smart? How did you learn about food to begin with. Were you brought up that way? Victoria: Actually my father was a pharmacist who was very interested in herbs and I started picking up dandelions when I was like five and six. I think that was the key. However, I was brought up on a typical food that was typical in Russia.The main …. typical as it is in the United States and late in life when I became very ill, with arrhythmia, and my family became ill, then I started to look into what would be the reason for being so unhealthy and then I studied to look at the food and I know that the main way of eating actually is not really very healthy and I think it was because on the large scheme by the industry. The industry. The food industry is a corporate business that is interested in products more than in our health. In some ways it works as an enemy because they’re trying to hide things from us. We have to really, these days, we have to have our own brain working and we have to make our web research. We cannot rely on the industry for advise and you can find a little things available, plus I think that if you move in the direction of nature. More natural. When we can actually, have the ingredients in our hands when we put them in our cooking devices. For example, when you make a green smoothie. That’s the easiest, the fastest and very palatable way of consuming lots of natural ingredients. I think ingredients … there’s a combination, a duality. Combination of technology and nature in one cup. It’s like we have duality in everything, for example on one side there’s a science of all this meticulous research and now researching on microworld, on the level of nanotechnology. On the other hand there’s a wisdom of nature that’s been sustaining health for millions of years or thousands, whatever you believe in. In these smoothies you have combination of both. How great is that. Caryn: I think it’s pretty great and I think that we should be taking the best of everything. Victoria: Yes, and these smoothies have been really helpful to so many people because it’s really easy. It’s really nothing hidden there. You buy your own ingredients. There’s nothing, like no chemicals in there. It just took the world like gigantic green tsunami. And now I really spend much time, this year for promoting it for children because who will take Obama’s place and Vladamir Putin’s place in 20/30 years? Who will be voting for or against GMO’s and food safety issues in say 2040? Caryn: Commercials are not about healthy food. They are about eating junk food. Victoria: Junk food like pizza and all kinds of drinks. Caryn: Yes, and it’s not just from the television. It’s posted in their schools. It’s in their community centers. It’s coming out of their phones. Companies are targeting children now by sending them messages into their cellphones. They’re everywhere, in elevators. They’re everywhere. Victoria: … and fast and they aim at our children and why don’t we aim our children? So I decided to create children’s books of a very high quality. There’s some children books, created by people but because there’s no profit in that. Absolutely no profit, nobody would ever give you a hand in promoting children’s health books. You have to do it out of your pocket. So I decided to create several books. I’m a best selling author and I have a publishing company. I know how to, what it takes to create a really really high quality book. So I held a competition for artist to illustrate my book. I have written five books for children. My favorite is the Green Smoothie Magic. That is a captivating story of an adventurous boy who learned how to be healthy in an enjoyable way and this not just preachy , saying that you must eat, you will be healthy, no. It’s a very captivating , really really captivating story with a beautiful gorgeous illustration. Caryn: Well I want to tell you that last night…I always read all the books before I talk to authors on my show. I don’t often read children’s books but I like them very much and they’re a lot easier to read. and so before going to bed last night, I read Green Smoothie Magic out loud to my partner Gary, and it was wonderful. I really… your right, it’s a captivating story. The art work is really beautiful. I enjoyed it as an adult, I enjoyed reading the story. I wanted to know how it ended and I just really enjoyed it very much and didn’t know you had more of them. I’m going to have to read them too. Victoria: Well I have five, and what’s interesting about Green Smoothie Magic book , that I gave away last year, five hundred copies for free because there’s really no market. People just don’t buy healthy books. They just don’t think how important is that. I give them away and many parents told me that this is the first time when they really got the idea of why green smoothies are so healthy. They said well…I actually said I started to celebrate, in the morning. I went to the kitchen with intent to make green smoothie for me too. I guess it’s really delivers the message. Caryn: Yes, you really did an excellent job, I really like this book and I think the holidays are coming up. Might be a little wide for a stocking, but it would make a nice edition to a pile of gifts, I think. Victoria: Yes, and you know children love to read the book they like many times. I know from during my two grandchildren, by reading this book, young readers will begin to develop naturally, healthy way of thinking. Because they are sick and tired of us telling them eat your carrots, eat your broccoli… Here they won’t be defensive. They just like this little boy, Nick, who is the hero, and they will associate themselves with him, hopefully and the more children have access to natural health messages, the better is for our world. Again. they’re going to take care of us. What are we thinking about? Who’s gonna decide when we get older, when you and I become 78 years old, who will be making decisions what to feed us? Victoria: We don’t want them to just euthanize us because we don’t know what to do with us. We really have to educate them. What do we do for that? Caryn: Absolutely, the sad thing is though, you probably know this Victoria, is that some of the studies are coming out now saying that the young people today aren’t even going to live as people live today. Victoria: Yeah, This is true. This is the way for them to research and also, where does adults learn about health? They either learn it from their friends or they learn it from literature. If you go on Amazon there are over 500 books published, with the words “green smoothie” in them but children don’t have that opportunity. They don’t go to Amazon and there’s nothing written so they can understand. There’s really no health celebrity. I hope that some authors who hear me or some publishers will begin to really spend time on this. Also, I hope that our government will begin to subsidize and take care of it because we all are very interested in having a healthier generation of people coming after us. Caryn: Well, we live in a society that is profit motivated and capitalism is designed so that the goal is to make a profit and corporations are designed so that shareholders are happy and we need to change that philosophy. We need to make it… All businesses certainly, should be profitable but there should be a social element to it where they’re doing something good for the world. I personally don’t think it should be a shareholder driven thing. That’s just my personal opinion and we got along way to go before that changes. I could see and I see it here and there where some companies make a blended drink that has greens in it. Victoria: Yeah, they have to because there’s such a demand in society and I’m constantly contacted with different people from all over the world that want my signature, my approval of some kind of powdered drink, some frozen drinks, some pasteurized drinks and I’m telling them always no, I would never ever support anything like this because green smoothie is the essence of… the essence of green smoothies is that you choose… you pay your own dollars for the produce you want to go in there. So there are no preservatives in there. No chemicals. This is why it’s so healing because it’s natural and you see with your own eyes, what’s in there and then you drink it, you’re sure that it’s good stuff. You know Caryn, I receive testimonials just before you called I received another testimonials. I received another testimonials every single day. Even diseases like arthritis and depression and all kinds of different pains, and eczema and diabetes. They reversed. Even though I’m not a medical doctor and I’m not supposed to prescribe anything but they just testified that their disease reverse by consumption of one quart of green smoothie every single morning and this is absolutely true. I’m actually collecting testimonials and I decided to put them in some kind of a book. I will publish them because it’s the power of green smoothies, so huge. I recently discovered that Swedish scientist. Some of the Japanese scientist, they discovered the huge importance of magnesium. It’s been underestimated. You know that in the middle of chlorophyll molecule, there is an atom of magnesium. With green smoothies, there’s lots of magnesium, and now Swedish scientist. They could link magnesium to deficiency to such thing as depression, diabetes, obesity, cavities in the teeth. So many things, osteoporosis are apparently, 1.5 % of our bone is magnesium and more than 80% of Americans is significantly low in magnesium. Either you drink green smoothie every day and improve your health or you begin to take supplements which could be iffy and questionable and could have side effects. Caryn: That’s right. We’re complicated human beings and all living beings are complicated . A lot of things work together. Hundred of thousands of things occur every minute in our bodies. For scientist to think…it’s just easy for them to isolate something and see how it works and how it helps and how it hurts but too many things work together in harmony and the best way we’re e going to get that is the way that nature planned it from whole foods. Minimally processed foods, plants, that have them all practically in the ratios that we need them. Victoria: Yes and according to the anthropological research, humans in history, they used to eat mostly greens every day and lots of fruit. Their diet could be up to 40% of different greens that are edible like young leaves or fruit trees for example and some herbs, some grasses. Today we practically don’t eat that. We just eat wilted iceberg lettuce in the Subway sandwich and that’s about it, maybe. Caryn: Yes, we don’t pull it out. Victoria: I think we need to have about a pound of greens every single day. Caryn : At least. yes I agree. Victoria: Because in ….. history, people probably were spending several hours chewing those greens…and had better, better teeth. So now we have mechanical teeth, a powerful blender, a powerful blender that helps us to blend it so its easier, absorbable. Easy digestible. I even found out through observation that if people prefer to eat greens in a salad they need to eat two pounds a day to completely answer all the request of the body nutrition. If they blend it 1 pound is completely enough. Because when you blend it, then the body absorbs it more completely. Caryn: Right, it’s more absorbable. I had heard that. I love green smoothies. I love anything green. I eat green foods every way I possible can. I have my green juice everyday and I eat salads and I steam them and I make blended salads or smoothies from time to time. It’s all wonderful. Do you know, I’m not going to name any names but I know that there’s one doctor that I respect a great deal but he doesn’t thank smoothies are a good thing. Victoria: Yes and I wrote to this doctor, open letter. You’re talking about the doctor who says that blending destroys the fiber correct? Caryn: I think he was saying that it wasn’t good because you add a lot of sugars to it and for people who are especially sugar sensitive, they’ll get a lot of calories and not… I thought it was crazy personally. Victoria: I have responded to every single criticism that I was aware of and this one also. Online there is Boutenko Films on YouTube and there you can find, several live testimonials. One particularly is about, taken of a woman. She’s from India, who’s been on insulin for 17 years and with type 1 diabetes. On camera with no interruptions, she is measuring her blood sugar with is high, then she takes drinks with banana in it. She’s scared, she takes it and then she waits like two minutes lowers the blood sugar and it becomes lower. In my green smoothie retreats I noticed that diabetes, especially those that come taking medication. They are so afraid of not taking medication and I’m telling them you have to be careful because with green smoothies, from chlorophyll having magnesium in it, that interferes with your body how it works and it heals the diabetes very quickly. You have to be aware that your blood sugar could become too low, which is way more dangerous than having it too high and sometimes they end up eating dates because their blood sugar do become too low. You can go to the that Boutenko Films and actually watch this woman five minutes video and see for yourself that it’s true testimony. Caryn: Where will we find that, at Rawfamily.com? Victoria: I know you go to youtube and it’s free, Boutenko Films, and there are many of them. Of course, you have to be careful with diabetes. Especially diabetes type one. Because diabetes 2 decrease the amount of insulin you take and with type 1 diabetes, you have to also include exercise. It can not only be done with diet. We have published mostly information about this. Again, we are not doctors. We’re just share what we know, which you could apply and it helps. The medical doctors, they confirm that it’s possible to add vigorous aerobic exercise and increase your consumption of fiber and greens. That combination really does help with diabetes. Diabetes type 2 usually, if you begin to live on greens, it becomes reversed within 3 days, very very fast. It’s really so affective. I think, first of all, because of magnesium and fiber. Caryn: Well, what’s fascinating is two things. One is there are foods that clearly aren’t good for us and fill us with toxins and then there are foods that are good for us and not only nourish are body and strengthen are immune system but clear out toxins. Kind of like one or the other. The green smoothies,those green foods they nourish our bodies, they clean out toxins. They are indeed magic as you say in your little book Green Smoothie Magic. Victoria: Yes and green smoothie are also very delicious. There is a belief that’s popular that healthy foods are not delicious. This is not true about green smoothies. If you make proper green smoothie, it is so palatable.Everybody who tries it the first time, they are very afraid to try it. Soon as they take the first sip their face usually lit up and they say wow that’s actually good. It’s so natural. You can actually taste the greens in it because there are fruits, there are mangos or bananas or apples that completely dominate the flavor of chlorophyll. Like if you will just blend greens, it will smell just like the grass of your lawn. It will smell very very strong. As soon as you add fruits to it. I would between 40 and 60% fruit. It’s depending on your choice. Then it really dominates both the flavor and the taste and it’s so palatable. Even children have no reservation to drinking it. Caryn: Now you raised how many children? Victoria: I have three children and two grandchildren and lots of nephews and nieces. Caryn: Did you raise your children on healthy plant foods from the beginning or did you make your transition later? Caryn: They have some good habits. Victoria: I see that and they just warm in my heart because I think well even …. I started not from the beginning but they have already good habits and this is so great. It’s cool. I am kinda happy for them and I don’t have to worry. Caryn: Right, now was it easy from the beginning or did they resist when you first wanted to change the food? Victoria: Caryn, it was early enough they didn’t have a choice. Caryn: Okay, because it’s so hard for parents today, you know we were talking before about corporations and commercials but kids just want to do what everybody is doing. Victoria: First of all, there are two things you have to do. First of all , I inform my children. I always, when I read the book, I would always read parts of the book or tell them in my own words, for example, I would tell them that 80% of any commercial cereal has sugar in it and that’s what sugar does to your body. I just explain to them. Or I would tell them about GMO or something. I just told them facts that they could understand. Secondly, for example, I told them when they grow GMO wheat they have to wear masks when they harvest in it. The second thing, I always invited them… appreciated that they help and helping me even though, sometimes they were messy. I would say I need help to peel these bananas or I need help juicing these fruits and vegetables with carrots. If children participate in making smoothies or juice, they would want to eat it. They would want to just try it. They can not ignore it. Those two main recommendations, I would give to parents who want to include their children into eating healthier. Preaching works counter, it doesn’t really help. Caryn: It doesn’t work with kids. It doesn’t work with adults either because we’re just big kids. Victoria: Also by example, my oldest son, who has two children, recently, he pulled his… and he had a backache. I asked him why don’t he fast. He said I really don’t want to fast because I just would rather just take some pill. I said you know if you fast your children will see you fasting and they will ask you and even not asking and you tell them I’m fasting because my back hurts. That goes into their subconscious. So when they have pain they will do the same thing. So it’s very important because they really take examples from the parent. Victoria: Eventually, he did fast and his pain went away so fast and he kept raving, like wow, just one day of the water fasting and completely my pain is gone. Caryn: Yeah, we have some very distorted opinions and ideas about how to manage symptoms. How to manage pain and illness, whereas, some very simple things can really resolve many, many, many problems. Victoria: Exactly, exactly you know this year, the two children and I, we went to a place in Siberia, where there are 80 centenarians for every thousand of people. There’s lots of centenarians living in there. We went there with our cameras and we were interviewing people. Imagine there would be 105 old woman, who was born in 1903 or 1908 and we would ask her, do you take any drugs? Do you take any medicine? And she would look at us like we were crazy. She would say , no, no, I don’t. She’s 105 years old. She is sewing and she doesn’t even use glasses. She doesn’t have glasses. She was sewing mittens for her great grandchildren, whom she has like hundreds. So it was pretty amazing to see that people don’t take no medicine. This is in our world. Caryn: Yeah, so may people have just been manipulated to the point. where they think it’s natural. It’s natural to have problems as we age. So may of these problems which we cause or we put on ourselves. Well, we come to the end of the half hour, Victoria and I’m so glad to have this opportunity to talk to you. I love reading Green Smoothie Magic and I might just take it out and read it tonight again. Victoria: Yes everybody go to Amazon look for Green Smoothie Magic. Caryn: Yes. thank you for everything you’re doing. Victoria: Thank you for having me here. Caryn: Okay, take care and be well. Caryn:Green Life, right on. That was Victoria Boutenko and you can find out more at Rawfamily.com. There’s a lot there. Okay. That’s it. You’ve been listening to It’s All About Food. I’m Caryn Hartglass. Visit me at ResponsibleEatingAndLiving.com. Have a delicious week. Thanks for this. Have been following Victoria and using/advocating her recipes for years.